wanderlust ATLANTA: 5Church's New Menu...and More! When I tell my friends that I'm going to dinner, their automatic response is, "Are you going to 5Church?" It's a legitimate question, because oftentimes I am indeed heading to 5Church Atlanta! Chef Scotley Innis has been with 5Church Atlanta for only a little more than eight months and, proven by his omnipresence at a bazillion Atlanta culinary events, he's totally a celebrity chef! He's one of the most personable executive chefs you'll meet; he was brilliant on 5Church Atlanta's television debut on Late Nite Eats on the Cooking Channel; and he's developed a new menu that leaves even the most seasoned foodie totally starstruck! 5Church Atlanta's specialty cocktails take 'craft cocktails' to a whole new level, in my humble opinion. 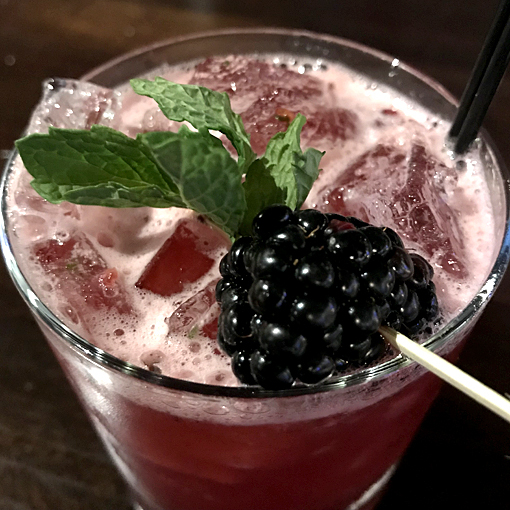 For instance, the Holy Water cocktail is composed of Four Roses bourbon, sweet tea, lemon juice, blue agave, mint and blackberries! THIS cocktail is as beautiful as it is delicious! That blackberries happen to be my favorite food has nothing to do with my thoughts on this one. Well, maybe not nothing. 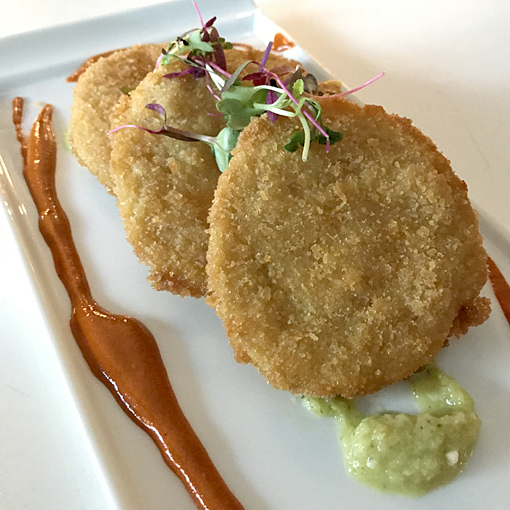 Chef Scotley is proud of his Fried Green Tomatoes, and rightly so! I would be too, if I had come up with the idea to slather the tomatoes with house-made pimento cheese before breading and frying them. They're accompanied with some salsa verde and a generous drizzle of smoked paprika oil. I wish they'd jar that smoked paprika oil...I'd put it on everything! I've enjoyed these a number of times and always suggest them when friends ask for a restaurant recommendations. 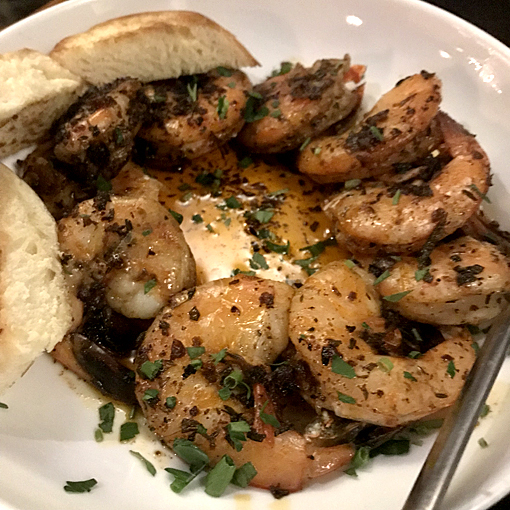 When you order the New Orleans BBQ Shrimp, as soon as it comes to the table go ahead and ask for more bread. That way you don't embarrass yourself licking the bowl in a public place. Seriously, it's that good! Once you've soaked up all this New Orleans flavor, you'll be ready to, "Laissez les bon temps roulez!" This eat-with-your-hands dish is treated with rosemary and thyme butter. They have a little heat, as you would expect from a New Orleans-style dish of this nature, but it's more spicy flavor-wise than heat-wise. At a dinner with my friend John, I had the awesome opportunity to try one of Chef Scotley's new menu items before it was available to the public. 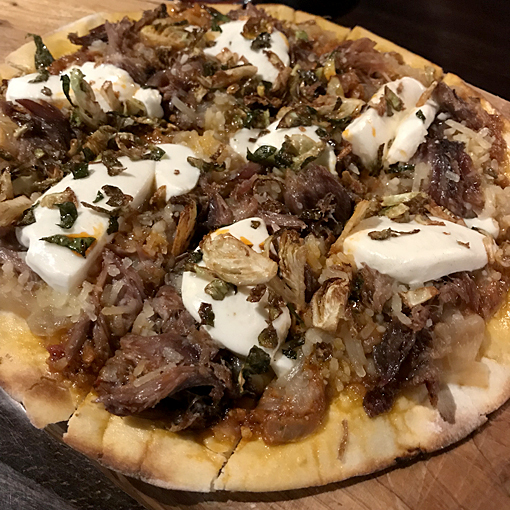 We had the Duck Confit Flatbread. Let me tell you, the foodie gods were with me that evening. This 'First Course' dish is easy to share, but there will be a battle between your mother's voice in your head telling you to share and the other voice in your head saying, "This is too damn good to share! Let them order their own!" I've been back to the restaurant for this dish time and again, so that makes sharing easier, knowing that I can always come back for more. Mother would be proud, right? If you get to 5Church Atlanta and you're in a pasta mood, fortune will shine upon you in the form of Chef Scotley's new Short Rib Pappardelle. 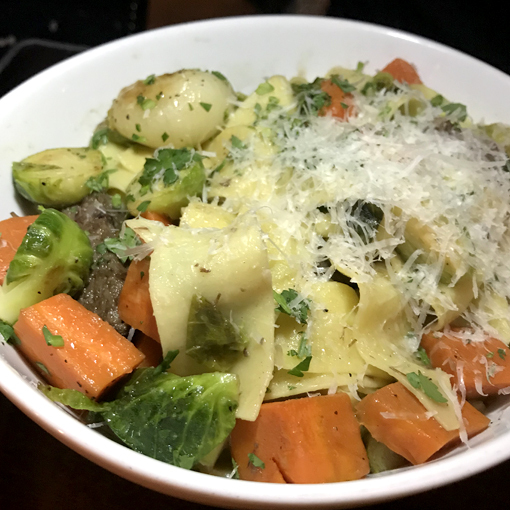 You will be feasting on brussells sprouts, carrots, cipollini, smoked parmesan, and beef jus. This dish is definitely comfort food elevated! Ayman Kamel, owner of 5Church Atlanta and an immediate friend after my first visit, treated a group of bloggers—mostly food bloggers, but I was invited as a super-fan—to a tasting of Chef Scotley's new menu a few months ago. Some of the dishes I'd already had the great privilege of dining on, but this feast was magnificent! My friend Sue, of Field Trips with Sue/365 Atlanta Family joined me and thoroughly enjoyed the experience. Lamb Porterhouse. Need I say more? This is a personal favorite on Chef Scotley's new menu...it immediately takes you to your happy place. I love lamb—ate a lot of it when I lived in Greece, and a lot more since—but to call this amazing comfort food would be insulting. This is fine dining...elevated! 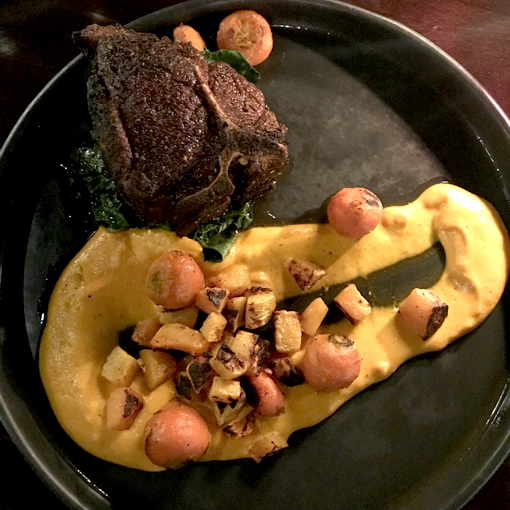 The super-thick-cut lamb comes with root vegetables, carrot puree, confit, cherry tomato, and rainbow swiss chard...it's an amalgamation of all that's delicious! Don't let this photo fool you...that plate is massive, the Lamb Porterhouse is a satisfying generous cut. When Nikki and I recently went to dinner with Patti and Eric, he had the Rabbit Pot Pie. Eric has a talent for ordering the best dishes. He's often the envy of his fellow dining companions. This dish was no exception. 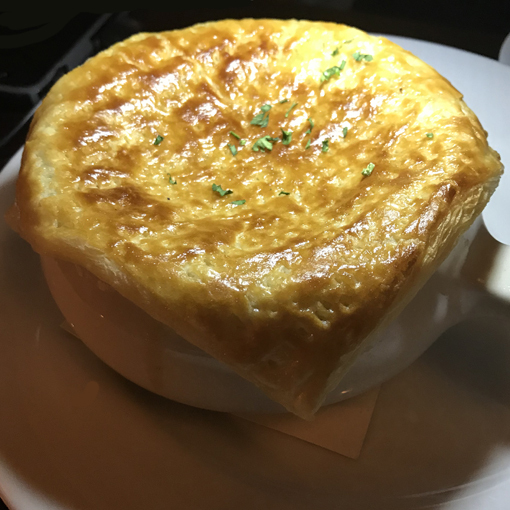 Although quite happy with the dishes we'd each ordered, when Eric offered a bite of his Rabbit Pot Pie, not a single one of us said no and not a single one of us were without "This is so delicious!" smiles. Nikki and I discovered the specialty cocktail Verde on one of our earliest visits to 5Church Atlanta, and have revisited this amazing libation a few times. She loved it not only because it's made with gin, but also because it's a cocktail that departs from the overly sweet specialty cocktail that's probably been a little overdone over recent decades. 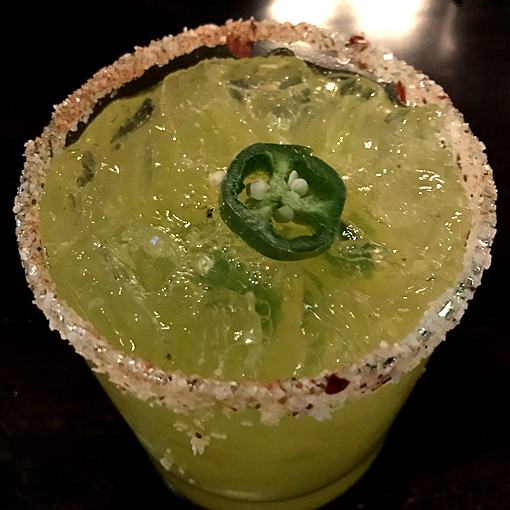 The Verde is composed of Hendrick's gin, cilantro, lime, fresno, and chillies! 5Church Atlanta's beverage menu is extensive. Dining with a group of folks who all have different favorite drinks? 5Church has you covered! As much as I love fish, it's not something I usually prepare at home, so I'm grateful for chefs who are brilliant with these treasures from the seas (and rivers, too). 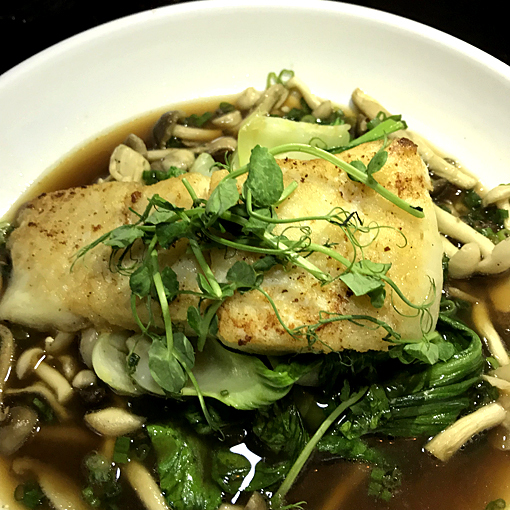 5Church's Halibut dish is treated with an Asian flare, built with gingered bok choy and shiitake mushrooms in a sesame shoyu broth. Salmon is a personal favorite, but when I heard "citrus beurre blanc", I was in love! 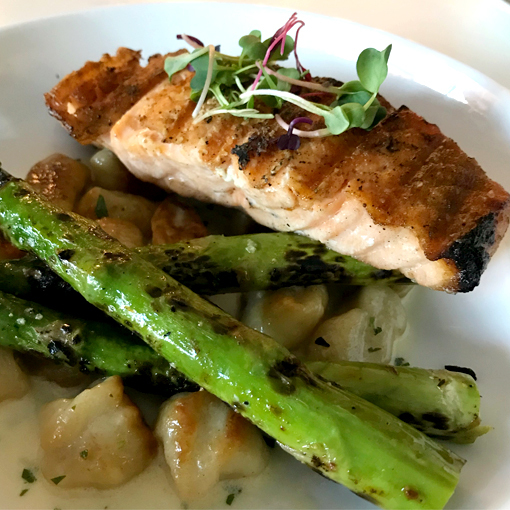 Chef Scotley's Grilled Salmon comes with potato gnocchi, grilled asparagus, and a lovely citrus beurre blanc. I say "lovely" because many others, as I did, will fall in love with this dish. You know my friend Patti, one of the founders of Atlanta Movie Tours, right? Nikki and I went to dinner with Patti and her husband Eric one evening not too long ago—they'd never been to 5Church for dinner—and every dish we tried was perfection! I'd been wanting to try the Whole Fish at 5Church for some time and finally placed the order. 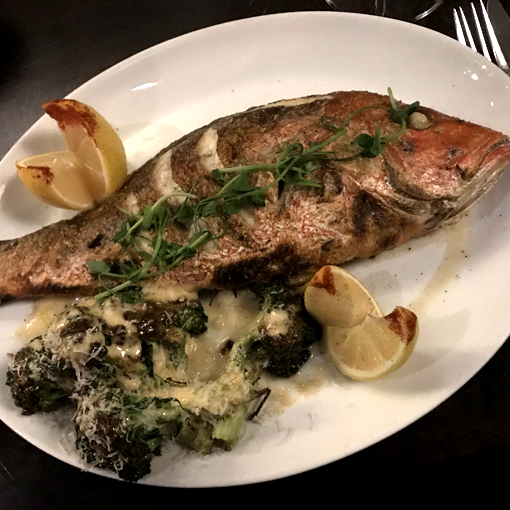 I'd only had a whole fish at a restaurant once before, in 2004 when in Moscow on a business trip. This fish was magnificent...I really have to ask Chef Scotley for the recipe. It was buttery, silky, and full of flavor yet delicate. I'd definitely order this again! Eugene, our server, is a fountain of knowledge and he's very attentive and polite, which is so appreciated. I have an insatiable sweet tooth! On the occasion that I have room for dessert when dining at 5Church, I've never, ever been disappointed! The 'Chocolate Candy Bar' dessert is a chocolate lover's dream come true! 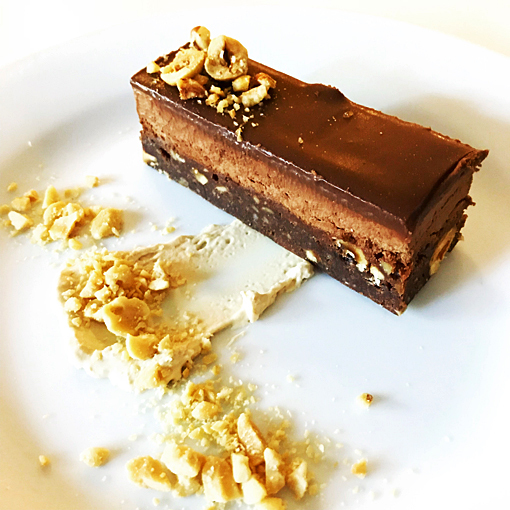 It'made with chocolate, chocolate mousse, chocolate, Dutch chocolate brownie, chocolate, peanuts and almonds, chocolate, whipped cream, and chocolate! A single bite will satisfy any chocolate craving, but I just don't have the will power to stop at one bite of this deliciousness. My dear friend Jay was visiting from California recently—we were best friends when we both lived in Washington, DC, and will be always. With precious little time to share, dining had to be special, while also contending with one of Atlanta's recent snow storms. Without a second thought, it had to be brunch at 5Church Atlanta. Jay loved the whole experience! Yay! I knew he would, but you totally want your best friends to love your favorite restaurant as much as you do. I had the Salmon Croquette Biscuit (pictured above). Served on an open-faced buttermilk biscuit—one of the best I've ever had (So sorry, mother!). This dish is built with perfectly poached eggs, peppers, onions, and seafood imperial sauce. Jay had the Crab Cakes & Poached Eggs and loved them! A crab aficionado, his total enjoyment was high praise. My friend Jeffrey is a huge fan of 5Church Atlanta's brunch. I believe 95% of his 5Church experiences have been brunch. 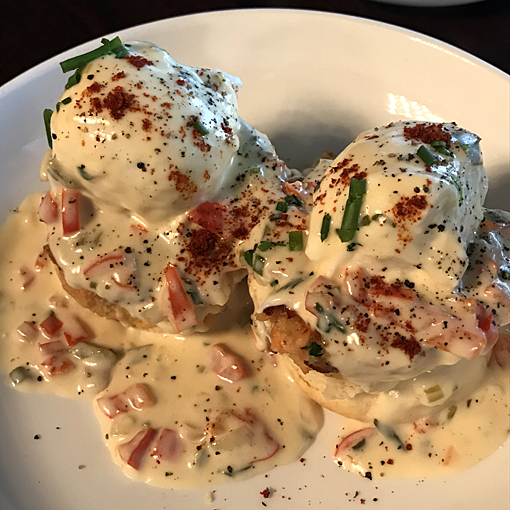 If you're ever with a group of friends undecided on a brunch destination, insist on 5Church Atlanta...you'll be the superstar! Nikki and I went to 5Church Atlanta for the first time last May and it has since become one of my favorite Atlanta restaurants. 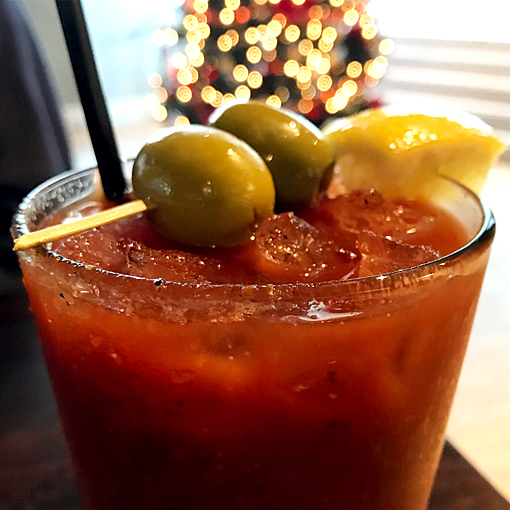 If you're looking for a dining destination for a special occasion, a regular happy hour meeting place, or simply a delicious meal, 5Church is the dining destination!